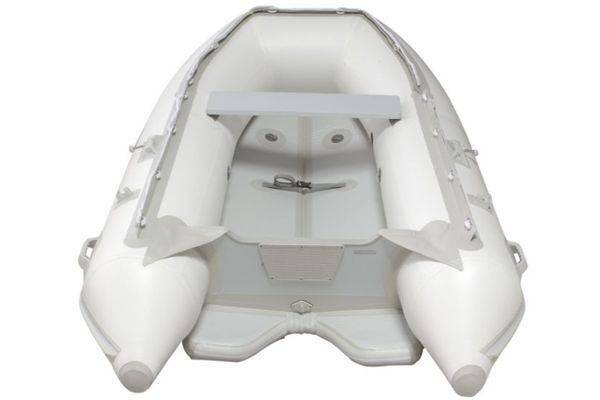 The Sirocco 350 Air Hull is an innovative inflatable tender which overcomes many of the storage problems associated with dinghies on cruising yachts. With a 10 or 15Hp engine the Sirocco 350 is a stable, practical, seaworthy vessel capable of carrying 4 adults at reasonable speeds on extended trips. 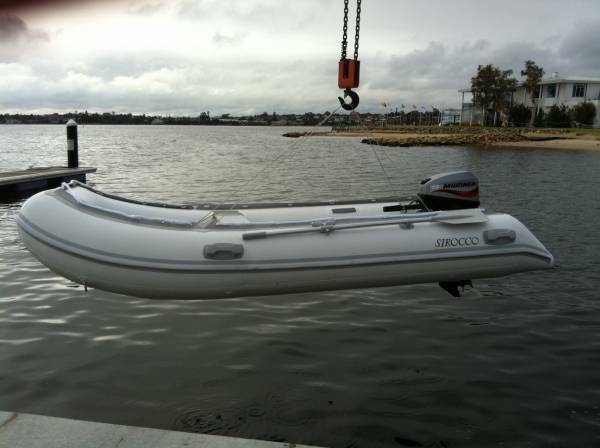 The Sirocco 350 Air Hull is a lightweight (47 kg) PVC inflatable. The air hull provides a soft dry ride although the constantly moving floor is initially disconcerting. Once you get use to having your feet dance to an underfloor beat the ride is very forgiving and dry. The addition of “planing flaps” assists with helping to lift the boat quickly onto the plane. 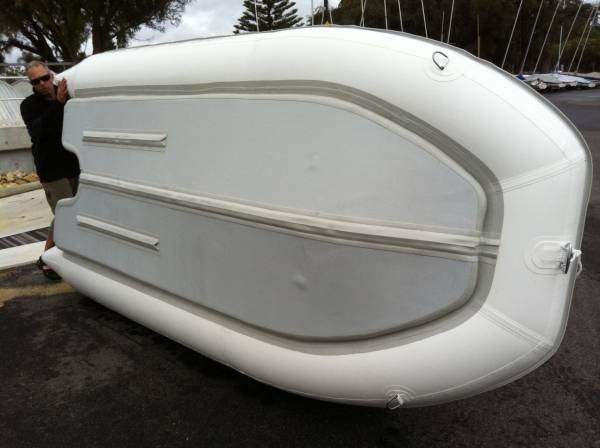 The twin air hulls mean the boat can be fully folded into an easily stowable package. A good quality air pump makes the time to get mobile very manageable. We used a 12V Airhead high pressure pump. It inflated the three main tubes quickly (5 minutes total) to their rated pressure of 2.9 psi. The air hulls require a pressure of 11 psi and the high pressure foot pump was required to supplement the electric pump. Another 10 minutes and we were ready to launch. The Sirocco 350 Air Hull has four lifting points, stainless steel towing rings, three rubber wear strips on the hull, plus fuel tank tie down points. With a current list price of $2,990 the Sirocco 350 appears to be excellent value. It certainly fills a niche for cruising sailors who want to explore their surroundings without towing or carrying a tender on davits. Being PVC you need to be conscious of minimising the UV exposure and additional care will be needed when going ashore in coral/rocky conditions. Rated load carrying capacity is an enormous 900kg and a 9.8 Hp outboard with a smaller pitch prop managed to achieve over 12 knots with 4 adult passengers. Each person weighed approximately 80kg and the outboards were a 9.8Hp two stroke Tohatsu and a 15Hp two stroke Mariner. The propeller pitch on the 9.8Hp Tohatsu was decreased from the standard 8.5 inch to a 7 inch pitch with great results under load.